Simple Sugar Coated Doughnuts - Let the Baking Begin! 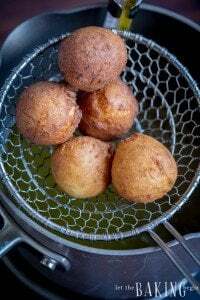 Simple Sugar Doughnuts – The dough is made with flour, milk, yeast, and sugar, then the donuts are fried and dredged in sugar. Very simple, but very indulgent little treat! Very fluffy, with sweet sugary coating these doughnuts are a classic. Eating them as soon as they’re just cool enough to gobble down with the outside still crispy from frying, is a truly satisfying experience. 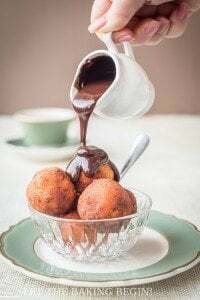 As I saw my daughter waiting for me to fry the doughnuts, I remembered myself sitting at my grandma’s kitchen table, resting my head on the palms of my hands, watching her every move as the doughnuts bubbled away in the hot oil. Grandma would make a ton of them, making sure that everyone in her big family got to have as many doughnuts as they wanted. Ripping a doughnut with my fingers today, and allowing my nose to inhale the aroma of a freshly fried doughnut, I can’t help but miss her as I am reminded that in a month it will be 5 years since she left us for a better place. 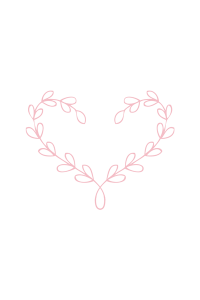 Most of my best memories revolve around family and food and I hope that when my daughters grow up, I’ve helped them create enough memories to be inspired and carry on the legacy of making homemade foods from scratch, with real ingredients and lots of love. The original recipe came from Flour Child. Super Soft Doughnuts – A classic doughnut with a simple sugar glaze. 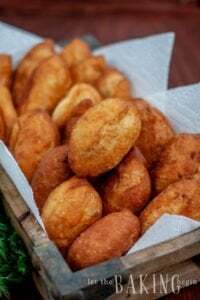 Quick Ricotta Doughnuts – Mini ricotta doughnuts made simple and delicious. 15 min Ricotta Donuts – Donuts made with ricotta and dipped in powdered sugar. 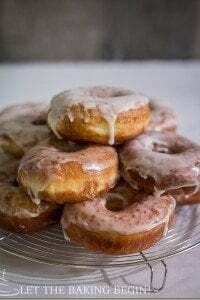 Simple Sugar Doughnuts - The dough is made with flour, milk, yeast, and sugar, then the donuts are fried and dredged in sugar. Very simple, but very indulgent little treat! Stir warm water, sugar & yeast in a tall glass. Leave to rise for 5 minutes. Mix together flour, milk, room temperature butter, yolks, sugar and the proofed yeast mixture in mixer on low speed, with dough hook attachment until the dough comes together. Slightly increase the speed and knead for another 5 minutes. Pick up the dough, form it into a ball. Butter a large bowl (for proofing), place the dough ball in and butter the outside of the dough to prevent skin from forming. Cover with a clean kitchen towel, place in a warm draft-free place and allow to rise for 1-2 hours (depending on how warm it is) until doubled in volume. Line a jelly roll sheet with wax paper/foil, spray with nonstick spray/butter with room temperature butter. Cover cut out doughnuts with a clean kitchen towel and allow to rise for 45 min to 1 hour. Heat 1½ inches oil in a heavy pot (cast iron) until it’s 350F. To fry doughnuts, drop 3-4 of them at a time and allow to become golden before turning to the other side, about 1 minute per side. Transfer to paper towels or wire rack to drain. Let cool. 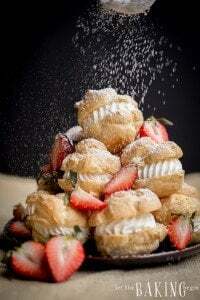 Once the doughnuts are cool enough to handle, roll them in granulated sugar or powdered sugar. Unsalted butter is the normal butter ☺️. If you don’t mind the cake being salty, I guess it’s ok, but I probably wouldn’t use salted butter. Thanks Anna for your feedback! Made these doughnuts, but I think the recipe is missing some salt.